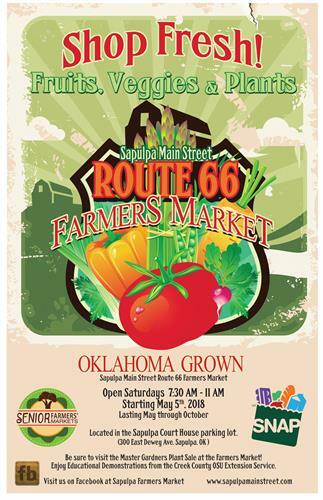 Sapulpa Main Street Route 66 Farmers Market is located at the Creek County Courthouse Parking Lot. At the market you will find vendors with meat, vegetables, fruits, plants, baked goods, honey and many other items. We accept the SNAP benefits as well as the Senior Nutrition card. Hope to see you at the market.